This ultimate combo makes for a full day of fantastic fun in Cabo San Lucas! Zip across Wild Canyon on a thrilling series of Zip Lines - ride tandem, or even as a family! Have lunch at the Lion's Den restaurant on site (optional) and then travel over to the dolphinarium in San Jose del Cabo, where you'll cool off with a Dolphin Encounter. Swim with real live dolphins! The best part is, by booking this Super Value Combo, you save nearly 25% off the Hotel Price of these tours! 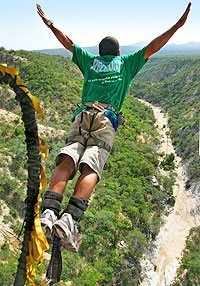 This Super Value Combo includes all the excitement of the Wild Canyon Canopy Tour, and all the thrills of the Dolphin Encounter. The only difference is the price! You can do these activities together in one day, or you can do them on different days, it's up to you. If you like, you can opt to do an adrenaline-charged Bungee Jump, Camel Quest or Extreme Sling Swing instead of the Canopy Tour, same price! Cruise Passengers: Yes! This tour makes a great shore excursion. There's even a special time for you! Runs: Adventure Park activities run twice daily at 9:00 AM and 12:00 PM. There is also a 10:30 AM pick-up for cruise passengers. Dolphin Encounter runs four times daily at 9:00 AM, 11:00 AM, 1:00 PM, and 3:30 PM. Duration: Adventure Park activities last about 3.5 hours. Dolphin Encounter lasts about 1 hour. Kids: Age limits as shown in the two activities selected. Restrictions: For safety reasons, people with a history of respiratory or cardiac problems, hearing difficulty or osteoperosis and pregnant women are not permitted on these tours. Guests must be able to walk in mountainous terrain for up to 15 minutes. Weight limits apply depending on which activity booked. Per Person. Includes Zip Lines & Dolphin Encounter. You may substitute Bungee Jump, Camel Quest or Sling Swing for the Zip Lines if you wish.